The Commissioner of Police, Lagos State command, Edgal Imohimi, has given a stern warning to policemen attached to divisions in the state to desist from wearing mufti bearing ‘SARS’ (Special Anti-Robbery Squad) while carrying out official duties. He threatened to sanction any policeman who violates the directive. To march his words with action, Edgal said the two policemen, who allegedly assaulted a lawyer last week in Ikoyi area of Lagos, would be demoted in ranks, for wearing plain clothes to effect the arrest of the lawyer. Egdal gave the warning at the third Stakeholders Security Meeting on Community Policing organised by the Area ‘D’ Command, Mushin, with the theme ‘Policing the community by the community’. He, however, said only certain policemen would be allowed to wear jackets with the inscriptions of their units on them. According to him: “Henceforth, no policeman should carry out operational duties in Lagos in mufti without police uniform. 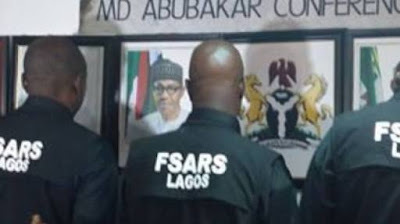 The only units allowed to wear jackets with the inscription of his unit on it are Anti-Cultism unit, Anti-Kidnapping unit, RAIDER and Federal Special Anti Robbery Squad (FSARS). Every other policeman on operational duties must be in uniform. “They would only be in mufti only if they are attached to the investigation unit of the command. We don’t want any policeman to cause us any embarrassment anymore. An example was that of the lawyer that was assaulted in Ikoyi recently by policemen who went there in T-shirts as FSARS. They will be reduced in ranks to serve as deterrent to others”. He, therefore, admonished Lagosians to report any policeman in uniform found drinking beer in a restaurant during work hours. The police boss also took a swipe on parents who neglect their children without giving them requisite training and guidance, while decrying the rate of drug intake and youths involvement in cultism. He said: “Cultism and drug intake have taken over our children. That is the greatest challenge that is confronting us in Lagos now. “People said I am hard on cultists and drug peddlers. But I have to be hard or else, they will take over our children and youths, who are our future leaders. What are we bequeathing on our children? Are we going to leave a community that is taken over by drug and cultism?